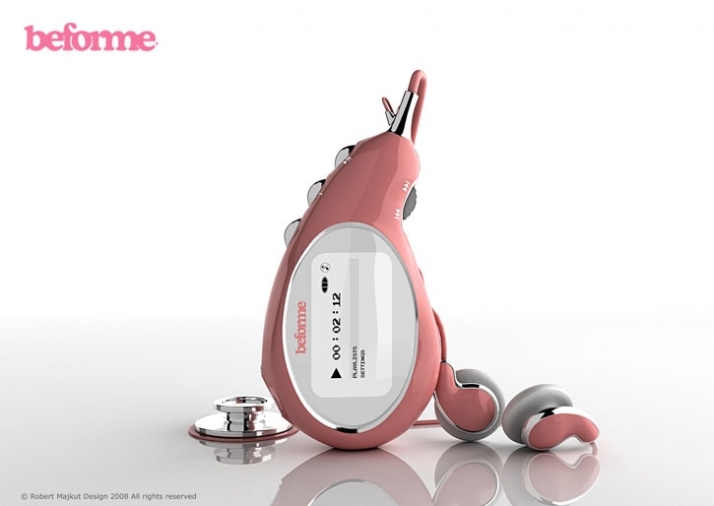 In care of your baby, we bring you „Beforme”. In this so special time of expecting, when the contact between mother and her yet unborn baby is variable, unclear and very often undeterminable, with a view of pregnant woman this such an interesting device was designed. We live in the time of great and rapid civilization changes, as well as woman’s nature changes, and the pace of life, stress and pressure of time or environment are only some of the factors, which have harmful influence on contemporary motherhood. All of this causes danger for both – mother and the child. Keeping the pregnancy nowadays is an fight, often on the psychological level, but unfortunately not always finished with the victory. “Beforme” is a turning point. Thanks to this device future mother has a possibility to enlarge the contact with her yet unborn baby. Creating “Beforme” we increased the chance that next time can be successful. „Beforme” is designed to please, to join the happiness of being pregnant with everyday responsibilities and not to give up the pleasure of contact with beauty. What is more, “Beforme” adorns woman through whole day, and at the same time, thanks to practically combined functionality, gives her the feeling of touch with the baby. It is not another medical appliance. 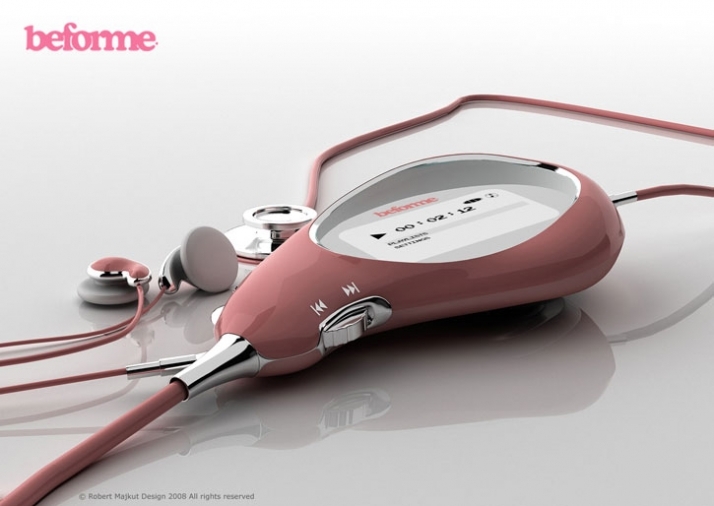 This is extraordinary and unique junction of the stethoscope and MP3 player. „Beforme” is the design and the technology hidden under the shape resembles embryo or hearth in order to be associated, by future mothers, positively in every aspect and to show them the proper direction. Touch of one button is the only thing that should be done by future mother in order to hear the baby’s heartbeat during those marvelous moments, when she walks through the park but mainly during those difficult, when she worries about child’s state. Thanks to our device she can listen and ascertain herself that everything is correct. Those such an ordinary things look the least obvious but sense of safety and positive attitude allow many moms for strengthening of ties with the child. “Beforme” support those acts. „Beforme” gives the possibility of recording sounds in order to consolidate functionality. It is very easy to change listening to the music for listening to baby’s heartbeat. On her own, mother can record that sound and later compare with model values, send to the doctor or create the diary of listening. Having this type of archive is the priceless and sentimental worth in that time of happiness given by the miracle of being. Additionally, in the future mom, together with her child, has a possibility to listen the young heart’s rhythm, recorded when they were the unity. Working with Robert Majkut everyday, from over ten years, I occupy myself with broadly defined design, as a planning, social and cultural issue. Now I can safely say that design is the essence of my life. One year ago, in June, when I found out that after 32 weeks of wonderful pregnancy, my sister’s son is no longer alive, and it is too late to do anything, the fact of “being too late” haunted me all the time. But it made me stronger to change something. The idea of “Beforme” arose in the train, during my trip to Warsaw. Before I have arrived, the issue was initially discussed with Robert. Today I dream of the “Beforme” helping as soon as possible, I dream of the day when future mother, meaning well, do not confuse the kick of her unborn baby with the inertness of no longer breathing foetus. Once, my friend said, “Life is a miracle” and I thought, “OK., but “Beforme” is the advice for contemporary woman how to protect this miracle. Today I am pregnant, “Beforme” is the prototype, and my sister still wants to fight. Less in Poland, but in world’s metropolises of design like Milan or London now is the time of designers’ and architects’ manifestoes. New sense of designing actions is in wanted generally. Most of those actions were under control of, firmly promoted by European Union, trend of being Eco. Very often those actions have no in common with taking care of people’s or planet’s good but only look or are inspired by aesthetical impacts in Eco style. I would like to suggest change of the direction and searching new areas, where contemporary human real needs are. I truly believe that “Beforme” is that kind of answer and that it would not be niche product, what I wish all future mothers. The device was created thanks to cooperation of two companies: Robert Majkut Design and Puffi Santel Intergalactico. Puffi Santel Intergalactico is the new company. Main aim of this company is launching into the market products, which support healthy and secure way of life. Company’s mission is understanding of constantly changing human’s needs and, thanks to connection of potential of relation designer – producer, effective launching products. “Beforme” is the premiere product of PSI. The idea and name were consulted with and designed by Robert Majkut. Now there is the stage of preparing the prototype. We hold the talks with prospect producers of the device, the largest world’s brands in RTV trade. 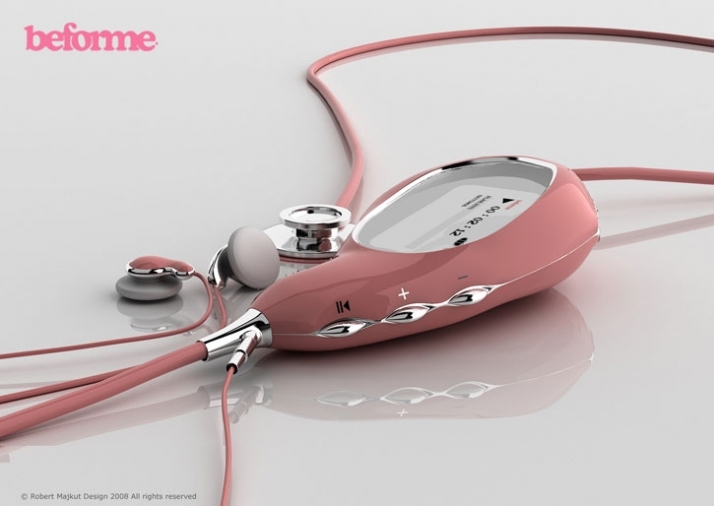 The innovativeness of “Beforme” is based on connection of two functions in one device: MP3 player and stethoscope which is used to listen to mother’s and foetus’ heart rhythm. 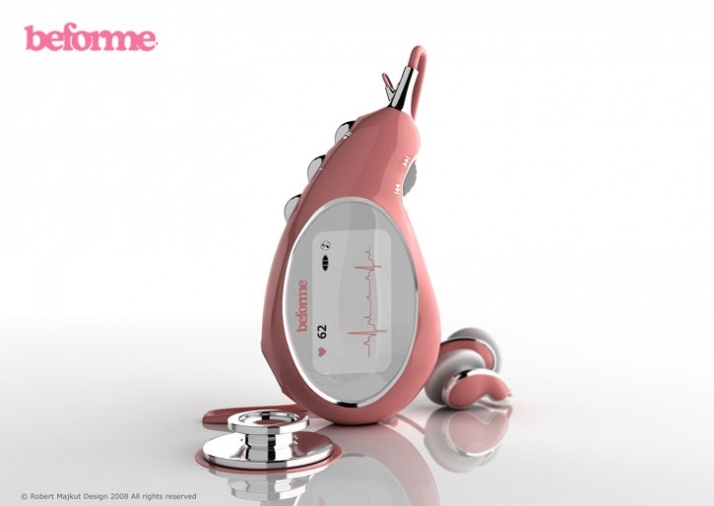 The device consists of three basic elements: headphones, corps and stethoscope.Thanks to appropriate software it is possible to make an analysis of correctness mother’s and baby’s heartbeat. What is more, there is a function of presenting it, as a graph, on the display. The recorded data can be transmitted to the computer through USB cable or Bluetooth. It is available in various colours.